Preheat the oven to 350. In a large bowl combine the eggs, oil, sugar, lemon zest and juice and whisk by hand for 1-2 minutes or until light in volume and color. Add the yogurt and whisk until well blended. Add the baking soda, baking powder, and flour, and stir until wet and dry ingredients are combined and the batter is smooth (though careful to overmix). 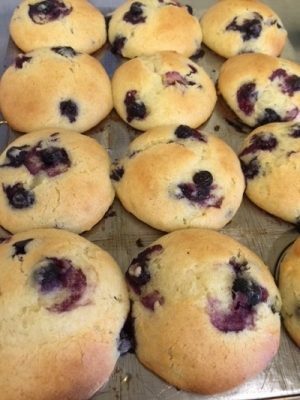 Fold in the berries and divide the batter evenly into a greased muffin tin lined with paper cups. Bake muffins for 28-32 minutes or just until no longer wet when tested in the center. Remove from the oven and let sit for 10 minutes before removing from muffin tin. – These muffins can be prepared, scooped into pan, and frozen raw. Bake muffins frozen (no thawing), and allow a few additional minutes baking time. – If desired, muffins can be drizzled with glaze made of confectioner’s sugar and fresh squeezed lemon juice. – Berries can be omitted and plain muffins filled with lemon curd piped in with a pastry bag, poking a hole through the tope of muffin into the center. Blanch the corn in a large pot of boiling water for 1 minute. Remove from the pot and allow it to cool before cutting the kernels off the cob. Place the corn in a large shallow bowl along with the tomatoes, cucumbers, peppers, and red onion. Separately whisk together the olive oil, red wine vinegar, sugar, salt and pepper, and add this vinaigrette to the vegetables tossing well to coat. Cover and let sit for at least 20 minutes to allow juices run and flavors to develop. Meanwhile, preheat a grill on medium-low. Cut the bread in half lengthwise, brush generously with olive oil, and grill cut side down for about 4 minutes or until the bread is well-browned and very toasty. Turn and toast the other side for another minute. Remove from the grill and rub the cut side of the loaf generously with the garlic cloves. Cut the bread into one-inch cubes and set aside until ready to use (you will need about 3 cups total for the salad). Add the cooled toasted bread cubes and torn basil leaves to the vegetables, tossing everything gently. 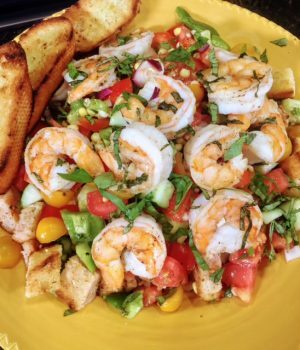 Allow the salad to sit for at least 10 minutes to soak up the juices before serving. Preheat the oven to 350. To prepare the topping, melt the 6 Tbl. butter in a medium saucepan over low heat. Add the brown sugar and whisk until smooth. Pour this mixture into the bottom of an 8” cake pan and place on a baking sheet. 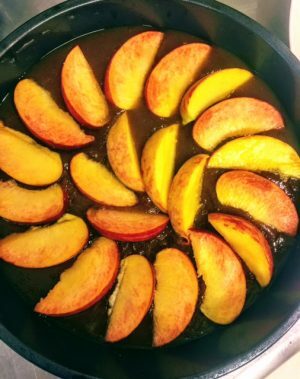 Arrange the peach slices in a circle covering the bottom of the pan and set aside. Cake: Use an electric mixer to beat together the stick of butter with the sugar until light and fluffy. Add the eggs and vanilla and blend. Combine the dry ingredients separately and add these to the mixing bowl along with the milk. Blend just until everything is incorporated and spread the batter evenly over the peaches in pan. Bake for 30-35 minutes or until the cake just tests done (there will be juices from the plums however). Remove from the oven and allow it to sit for at least 5 minutes to settle. Run a paring knife around the edge of pan and carefully invert the cake onto a serving platter (be careful of hot juices). Serve with vanilla or ginger ice cream. Variations: This cake can be baked in individual ramekins (4), dividing everything evenly throughout the recipe. Also, try using other fruits such as apricots, plums, nectarines, apples.